Our first article in Vol. 1 No. 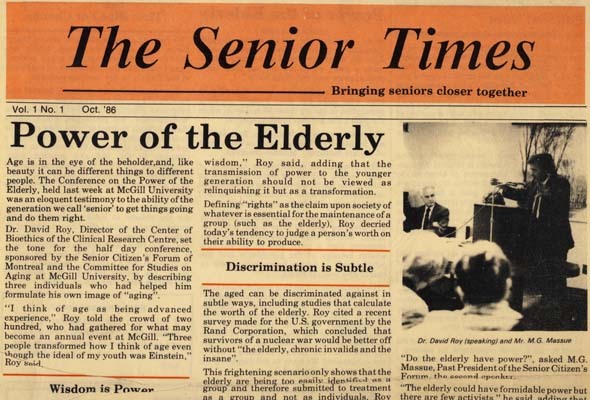 1, October 1986 was titled Power of the Elderly. To understand how we looked at seniors then compared to how we look at ourselves now (because many of us are now older, even though we don’t like to be called seniors) we have excerpted from the front page story by Donna Flint from that first issue. Canadians do it better: for them “elders” signify wisdom and are treated with great respect. “Age is in the eye of the beholder, and, like beauty, it can be different things to different people. The Conference on the Power of the Elderly, held last week at McGill University, was an eloquent testimony to the ability of the generation we call ‘senior’ to get things going and do them right. “Older people who have lived through a whole life span can interpret the meaning of time, said Dr. David Roy, Director of the Center of Bioethics of the Clinical Research Centre. Pointing out that each individual is a repository for all his memories from childhood on, he emphasized that each stage of life brings with it a different kind of knowledge and power, but that the final power of the elderly is that of wisdom. “Power can be defined as physical, financial, the power of knowledge, of information and of wisdom,” Roy said, adding that the transmission of power to the younger generation should not be viewed as relinquishing it but as a transformation. “Defining ‘rights’ as the claim upon society of whatever is essential for the maintenance of a group, Roy decried today’s tendency to judge a person’s worth on their ability to produce. Be the first to comment on "How the ‘power of the elderly’ has shifted over 30 years"